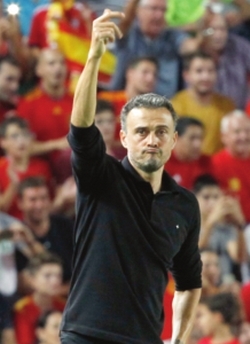 Enrique hails the perfect start as Spain boss | Daily Express Online, Sabah, Malaysia. ELCHE (Spain): Luis Enrique described it as the perfect start after Spain backed up their win over England with a 6-0 demolition of Croatia on Tuesday.Spain were three up at half-time against the World Cup runners-up thanks to Marco Asensio's two long-range strikes, the second going in off goalkeeper Lovre Kalinic, and an early header from Saul Niguez. Beating two of the World Cup's semi-finalists in four days leaves Spain top of League A's Group Two in the Nations League. "It would be very easy to say that this is my Spain, generating many chances and conceding few goals, but the truth is that I am changing things very fast," Luis Enrique said. "This week everything was perfect." "Comparisons with the World Cup and tonight do not make sense," Luis Enrique said. "Today we were very effective and everything went wonderfully well. They had an early chance, they didn't take it and then we played brilliantly and scored some great goals." "We cannot cry about it, we have to improve," coach Zlatko Dalic said. "What happened has happened, all their chances have gone in and it is better that it happened today than later. "After the first goal we were not so focused, we tried to do things too fast and started to abandon the system.